St Ives Guildhall hosts a range of events including - markets - live music - theatre - dance - comedy. Located right in the centre of town. The main hall has capacity for up to 400 people and stages live music and theatre on a regular basis.. 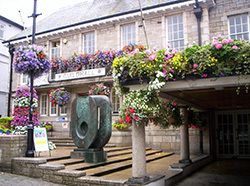 The Guildhall is the main venue for St Ives September Festival and hosts gigs every night. St Ives Farmers Market is open every Thursday all year round - plus there are other regular food and craft markets..
Live Music - Theatre - Dance - Comedy. The Guildhall regularly hosts entertainment of all sorts - with a varied range of events staged by Friends Of St Ives Guildhall and other promoters..
CAMRA Kernow Beer Festival in May - St Ives Beer Festival in August - St Ives September Festival. There are also markets and concerts during the Christmas period.